I did an Ask Me Anything webinar. I got some good question but it took about fifteen minutes to get going. I am hoping this will be the last of my videos which will be of my part latest course. I will make this part of Quant ELITE programme. As a result, all the latest videos will go private very soon to be part of this. Thee latest set of videos will no longer be publicly avallable on my Youtube channel. This entry was posted in Bitcoin Crypto Currency, Trading and tagged Ask Me Anything, big, coins, crypto, Playback, webinar! on October 8, 2018 by caustic. This was from last night !! Tonight is reminder about talking about the upcoming new course. There are recently posted videos below. The course description can be seen by pressing the big blue below. Also, note that this should be going live in the next day. I will have a very short lived intro price before going to it regular price. 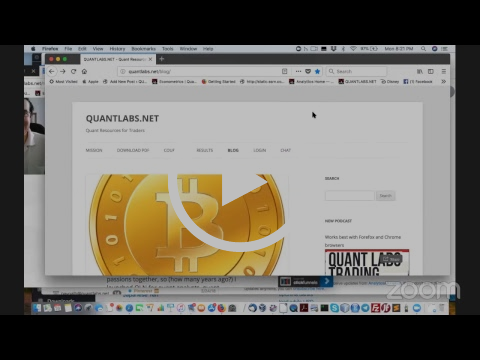 This entry was posted in Bitcoin Crypto Currency, Forex, Quant Development and tagged algo, cryptocurrency, infrastructure, Playback, Python, trading, video, webinar! on March 27, 2018 by caustic. Discover the secrets behind trading infrastructure components, high speed in-memory NOSQL database options, cryptocurrency exchanges and simple technical indicators, and more. And use the same techniques in your Python code. OVERVIEW – As Bitcoin ruled the financial news cycle in recent times, many have had a peak interest in cyrpto currency along with systematic trading. There are many advanced trading research techniques including machine learning, AI, or quant. It is very hopeful any student will become more confident in their capabilities to complete this without the unnecessary complexities that usually hold back their success. I will be holding a live Q&A/Presentation tonight at 7PM EDT (same as NYC). This entry was posted in Bitcoin Crypto Currency, Forex, Premium Membership, Quant Analytics, Quant Development and tagged algo, cryptocurrency, infrastructure, Playback, Python, trading, video, webinar! on March 26, 2018 by caustic. Which trading asset class has more profit potential? 1. Do you believe the volatility in crypto can make you more money ? Do you lose more if trading manually? 2. Does your major forex broker allow trading with crypto? Any small coins others than BTC, ETH, LTC etc? Do you see similar behavior in forex brokers as you would with large crypto brokers? 3. Outside of technical indicators, do you use any quant techniques? For example? 4. For crypto, which technical analysis indicators can work well in a predictable manner ? 5. If you can to choose which asset class, would it be only crypto or forex? Why? 6. Do you believe you need tens of thousands of dollars to be an effective forex trader? Do you also you can start crypto with literally nothing? 7. As a crypto trader, do you find it very difficult to trade dues to the unpredictability of it? Is there any predictability within forex? If so, what time frame an under what conditions? 8. Do you think the pricing behavior of forex and crypto are the pretty well the same outside of the unpredictable volatile nature of crypto? 9. Do you believe in this statement: main difference iin Forex, we could make big profit from it, but in crypto it made for little profit. Or this statement: Money is so fast in Forex, so fast to bankcrupt too if you made a wrong position. Crypto is safer, money can multiply too if you spot a coin before it pumps. So my vote is for crypto. How about hthis statement: Forex isn’t easy, yes, but the level of insider trading in crypto might just make up for that difficulty. This entry was posted in Bitcoin Crypto Currency, Forex and tagged crypto, ForEx, Playback, trading, webinar! on January 22, 2018 by caustic. Listen up! Not everyone is getting this last chance deal I will be posting for my 3 month subscription deal on my Quant Analytics service. This brings down your cost to under $50 per month. This is just a 1 time payment for 3 months access. 2. Forex volatility to showcase the best currency pairs for maximum opportunity. So why trade currency pairs you may never earn from unless you are willing to use extra risky leverage from your broker? 3. A new European Stats report to identify short and long opportunities for major EU member countries. Sounds exciting? You should be. Don’t forget I am still adding my daily trading view from my Bloomberg news consumption. This has been very helpful over the last few months. Lastly, all my future Monday nite events starting Jul 17 will be recorded live but the video playbacks will only be available to my members. Just consider thisanother exclusive benefit of this service. You can sample one of these highly educational videos below. In this 2 hour video, I talk about the various techniques and tools you can use to measure your portfolio goals, risk, and money management. I try to stress the importance of understanding how critical this phase is to be a successful trader. This gives you foundation with a set of rules which is critical for capital preservation which is the #1 goal in trading. Watch the video below! This entry was posted in Premium Membership and tagged algo trading, Playback, video, Wealth creation on June 27, 2017 by caustic.